The more you find that others care. 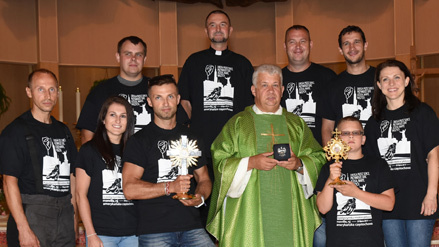 On July 23rd, 30 CTR parishioners, accompanied by Father Marcin mounted their bicycles and journeyed from the Sacred Heart Church parking lot to Doylestown, PA and the Shrine of the Virgin of Czestochowa. Dressed in their special tee shirts, the group, which, included both men and women, traveled 38 miles on their journey starting bright and early at about 5AM. At the start of the trip, Father Marcin led the pilgrims in the Holy Rosary by praying the first decade. As they traveled, the group took four rest stops praying one decade each time until the rosary was completed. Arriving just before 12:30, they celebrated the Eucharist and participated in the Mass by doing the readings and presenting the gifts. On the occasion of St. Christopher, the pilgrims had their bicycles blessed, enjoyed lunch, and either rode back to Manville, or hitched a ride from a family member who drove there. In addition to the bicyclists, Father Wojtek joined a group of motorcyclists who made the journey to the shrine. Hundreds of motorcyclists come from as far away as Chicago for the event. This is the ninth year of this pilgrimage. Several parishioners who have made the pilgrimage each time and hope to do many more in the future! Father Stan was left behind to "hold the fort" in the other priests' absence. 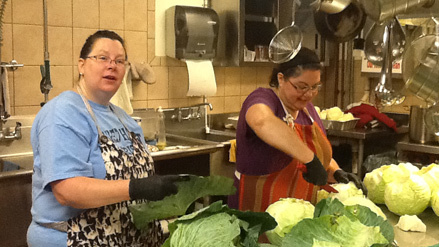 Most importantly, and nearly impossible to measure, are the number of volunteer hours spent in the preparation of the grounds, making of batter, peeling of onions, cooking of food, selling of tickets, serving of food, cleaning of pots, pans, spoons, griddles, and fryers. All of which are needed in order to make the festival a success. While many know and recognize those individuals that worked the various booths and worked in the various kitchens during the festival, what goes unnoticed except by those directly involved, are the many hours behind the scenes and in the auditorium preparing for and cleaning up after the daily event. There is no one job more important than the other, or one committee more devoted than the other. It takes the best effort of all those involved to make each year's festival a reality. Please consider joining your parish family next year in making this all happen. It's much more than sweat equity, but community spirit and friendly cooperation with the help of the Good Lord who blesses us with good weather and good friends and makes it all happen. You could be a part of it too! "Mighty Fortress" was the theme this year for Christ the Redeemer Summer Camp. This week of camp was a success and the campers all had a great time. The camp was held July 10-14 at Sacred Heart Church campus daily from 8:45am-3:00pm with over ninety participants of campers and volunteers that all enjoyed a great week of fun. Mary Ellen Day, or that week, the Queen was the director of the camp with the help of Princess Julie Pankowski. The assistant director couldn't have asked for a better weather for the campers or better group of volunteers who helped. Staff Rosemarie Charneski, Suzanne Runyon, Charlotte Snow, Frances Burell, Klaudia Bunkowski, Ela Poplawski, Maryann Zarbetski, Natalie Day, Gert Szczecenia and Shirley Imhauser all gave of their time for the week to give the children a fun camp. Thanks to all of the following for the generous donations: Mr. & Mrs. Lorenzo Bonanni, Mr. & Mr. Grundman, Pizza & Pasta, VFW Post 2290, Mr. & Mrs. Tylecki, Manville Hillsborough Elks, CTR Altar Rosary Society, Knights of Columbus St Jude Council, B & L Market, Fucillo & Warren Funeral Home, Zala Machine Co, Inc., and those who also made a donation. Thank you to Rich Komoroski of Kulinski Monuments for sponsoring our shirts. Each morning began with Mass in the castle. Fr. Stan reflected on each day's theme according to the program. Children from grades Pre K-5 were split into five age groups and each named to fit the theme. Pre K/Kindergarteners were the Princes & Princesses, 1- were Dragons, 2-were Jesters, 3-were the Knights, and 4-5 the Kings & Queens. The groups spent their day with Religion, Art, Music, Sports and Activities and were treated to a trip to Medieval Times on Thursday. They watched and cheered for their Red Knight in battle to defeat the others and feasted on chicken, potatoes, corn while eating their entire meal with their hands. Food was plenty as campers received a morning snack, a hot lunch and an afternoon snack. The kitchen crew of volunteers prepared special treats of castle bricks, dragon claws, and knights to go with the week's theme. Campers also did a service project by donating food items for children participating in the Caritas Ministry. Each day they brought in something that children would like to have such as juice boxes, macaroni & cheese, granola bars, and fruit snacks. The camp week ended with a closing Mass on Saturday night. After Mass, the groups all performed a few of the songs that they had learned during the week. All the campers gathered in the church auditorium for a slide show of photos recapping the week, and everyone had a few laughs. Each camper received a prize, and the highlight of the closing ceremony was the drawing for the bicycles. Four lucky winners: Adam Miga, Gosia Wojtach, Kaitlin Leppert and Dominik Wojtach went home with brand new bicycles. Father Stan who enjoys the week as much as the kids do, said this camp "Mighty Fortress" and the trip to Medieval Times was "The best camp so far. Even though I liked the Wild West this was the best." Although camp for this year is done, the volunteers are already looking forward to next summer and planning the summer camp to make it exciting once again for the campers. For information about next year's camp or to volunteer, email ctrcamp@yahoo.com to get on the email list and information will be sent as soon as it is available. Ned and Barbara Panfile will be married 60 years next June 2018. That is quite a milestone!! They have been residents of Manville for 59 years, moving here after their marriage and Ned's graduation from Scranton University. 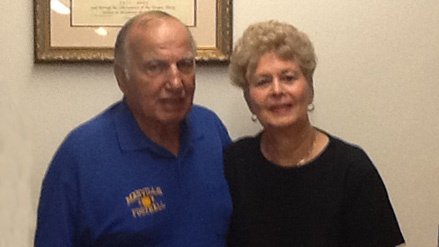 Ned immediately began his remarkable career in education for the Manville School District. He moved up the ladder from classroom teacher to vice principal in Manville High School. Ned also coached football and baseball at MHS, in addition to 20 years of coaching football at Princeton University. He currently serves on the Manville Board of Education displaying his tireless dedication to the students of our town. Barbara worked for Johnson and Johnson at Ethicon for 23 years before her retirement. She and Ned are the proud parents of Ned Robert and Nadine. Ned is married to Lisa and have 10 year-old twins. Ned has followed in his father's footsteps as a teacher and now athletic director in Mendham, NJ. Nadine and her husband, Steve, are recently retired from law enforcement in Ocean County, NJ working both in forensics and field work. Ned and Barbara enjoy watching their granddaughter, Elizabeth, perform Irish step dancing and their grandson, Ned Robert III in various sporting events. Ned and Barbara joined Christ the King Parish when they first moved to Manville 59 years ago and have been active members ever since. Interviewer: Tell us about all the ministries you volunteer in for our parish. Barbara: I have been the Prayer and Praise Group Leader since 1989. We currently have 23 members and meet once a month at CTK Church. During our hour-long gathering, we read scripture, sing, and pray. We pray for everything: the sick, our town, world issues and concerns, and anything else we feel is needed. As the leader, I do all the planning and prepare a teaching lesson each month. 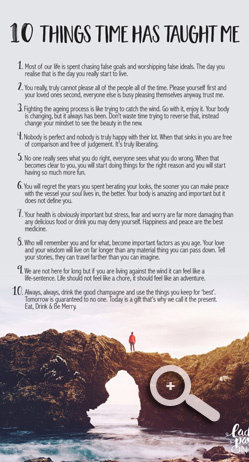 These can be related to the scriptures or healing. In addition, we are also a praise group so we spend time showing gratitude and appreciation for the gifts and graces we receive. Ned: I was one of the first Eucharistic Ministers when that ministry was formed at CTK. I have served at Mass, funerals, and other special services and ceremonies. In addition, I am an usher for Saturday and Sunday Masses. 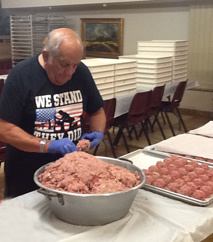 Ned and Barbara also volunteer every day during the Summer Festival in the kitchen each morning helping to make stuffed cabbage and/or doing whatever food preparation is needed for that evening. Interviewer: What do you find to be most fulfilling in your ministries? Barbara: The Prayer and Praise Group is my number one priority. It fills us up and gets us through the month until we meet again. Working with all the people during the festival is so much fun. 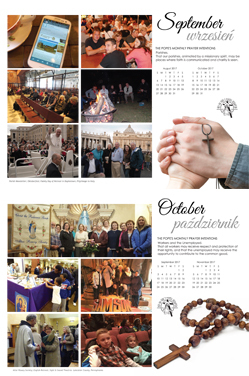 As we work, we talk and get to know other members of our parish. Just working together is such a pleasure. Ned: I love the comradery when I serve as an usher, especially after Mass. I see so many people I know or who I remember when they were students in school, but haven't seen for a while. I have an opportunity to talk to them and catch up on their lives and how they are doing. We are like an extended family. Ned and Barbara have been active members of the Manville community and parish since they became residents 59 years ago. They are so thankful of how good the town has been to them and want to give back in any way they can for the kindness they have received. They have certainly succeeded in showing their gratitude, and for that, our parish has been the benefactor. What could be better than spending the day on eight different roller coasters or cooling off in an expansive water park? Nothing, according to Michelle Miga, one of CTR's altar servers who will be spending the day at DorneyPark in Doylestown, PA, on August 7th with all her fellow altar servers. Michelle, who has been an altar server for the last two years, enthusiastically states those are her favorite activities at the park. Any young member of our parish, who has made her/his First Holy Communion, is eligible to become an altar server. New members are welcomed and encouraged to join. Training is provided and you would serve an important role assisting the priest and deacon at Mass and other services, celebrations, and parish events. More members would enable our parish to have at least one altar server at each Mass in both worship sites. Father Wojtek and Ms. Mary Ellen Day will be two of the chaperones joining the altar servers when they enjoy a well-deserved day of fun at Dorneypark. Will they have the courage and adventurousness to join Michelle on the Hydra or Stinger? We shall have to wait and see. POLISH PLATTER! POTATO PANCAKES! PIZZA FRITZ! During our annual parish summer festival, we interviewed "guests" in attendance as they waited in line for a sampling of our homemade gourmet delights. The respondents were old and young, Manville residents and visitors from out of state, first timers and repeat visitors. All had very strong opinions about their favorite food they were hungrily waiting to taste. Below is a sampling. Maureen and her 13 year-old son, Ryan, are from Woodbridge. They come every year to the festival and meet Maureen's best friend who lives in Manville. Ryan likes to play the games and his mom enjoys a sausage sandwich. Hillsborough residents Anna, a Manville High School graduate, her husband, Mike, and their two children Kathryn, age 6, and Luke, age 3, stop by the festival each year. They are parishioners of CTR and Anna's grandfather works in the kitchen peeling potatoes. Kathryn enthusiastically claimed potato pancakes are her favorite food at the festival. Twenty-eight year-old Steven from Piscataway comes every year to have our pierogis smothered in onions. He also likes to play the games. Ginny who is also from Hillsborough has come "for years" basically for the food. Her favorite is the potato pancakes. She knew to get her potato pancake number as soon as she arrived. Karen, who once lived in Manville, and her friend, Susan, who lives on Long Island came because of her friend from town. This is their first time here. Karen is Polish and wanted to try our stuffed cabbages. Melissa and Derek are engaged and getting married in May 2018. They live in Belle Mead. Melissa graduated from MHS in 2009. They come to the festival every year. This year they ordered 10 potato pancakes!! Kristina and her daughter, Madison, age 9, are from Milford. They are Polish and couldn't find good Polish food anywhere else. Kristina's father-in-law told her about our festival, and she has been coming ever since. They love the Polish platter. Adam, Melissa, and their four month old daughter attended the festival for the first time. Their boss had a meeting with Father Stan and he told them about the event. They checked the CTR webpage and found the information there. Kevin and his wife, Kazimiera are from Bridgewater. Kazimiera said, "I am as Polish as it gets!" She is originally from Poland and is now an American citizen. They brought along their good friend, Kasia, from Westfield who had not been at the festival before, but said she drives through Manville all the time and saw the signs advertising the event. She was very excited to try the yummy food we offer. What fun it was to meet and speak to some of our guests who come from near and far, stood in long lines, and joined the hundreds who knew there was no better place than the CTR Summer Festival to feast on authentic Polish food, take a chance on the games, enjoy the music, and possibly win one of the raffles we sponsored each night. Add newsletter@CTRManville.com to your address book to ensure delivery of these e-mails. Have parish news delivered to your email. Sign up for our newsletter on the website.